Increases the duration and rapidly drains the Mount Stamina of any enemy in the area. When the ball of caltrops initially explodes it deals immediate damage and briefly snares for more. Caltrops: Cost: [3780 / 3690 / 3600 / 3510] Stamina. Hurl an exploding ball of caltrops that scatter over the target area, dealing 1321 Physical Damage every 1 second and reducing Movement Speed by 30%. Anti-Cavalry Caltrops: Cost: 3511 Stamina, Duration: 14 seconds. Hurl an exploding ball of caltrops that scatter over the target area, dealing [1321 / 1335 / 1348 / 1363] Physical Damage every 1 second and reducing Movement Speed by 30%. The caltrops rapidly drain the Mount Stamina of any enemy in the area. Razor Caltrops: Cost: 3511 Stamina. Hurl an exploding ball of caltrops that scatter over the target area, dealing [1321 / 1322 / 1323 / 1324] Physical Damage every 1 second and reducing Movement Speed by 30%. When the ball of caltrops initially explodes it deals an immediate [1582 / 1599 / 1616 / 1633] Physical Damage and reduces the Movement Speed of enemies hit by 70% for 3 seconds. Caltrops deals Physical Damage over time in a large area. Anti-Cavalry Caltrops increases the duration and also drains the Stamina of all enemy mounts, which may force them to dismount, while the Razor Caltrops morph increases the initial damage and also reduces the movement speed of all affected targets. Previously, the Anti-Cavalry Caltrops morph would automatically dismount any mounted enemies, but now it just drains their mounts' Stamina instead. Thus, players who have invested in the Stamina Riding Skill may be able to withstand this attack for longer without being dismounted. 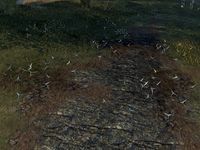 While Anti-Cavalry Caltrops is mostly only useful in Cyrodiil, Razor Caltrops is quite effective in PvE content as well.